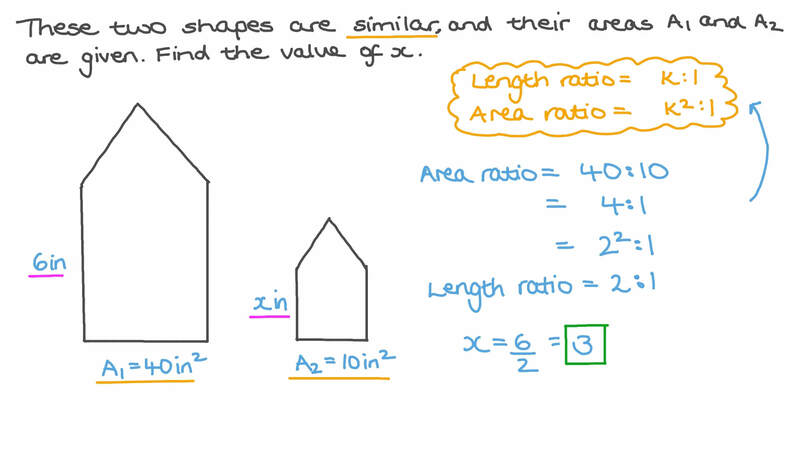 In this lesson, we will learn how to use proportions to find a missing side length in similar polygons. If 𝐴 𝐵 𝐶 𝐷 is similar to 𝑋 𝑌 𝑍 𝐿 , what is the length of 𝐴 𝐷 ? 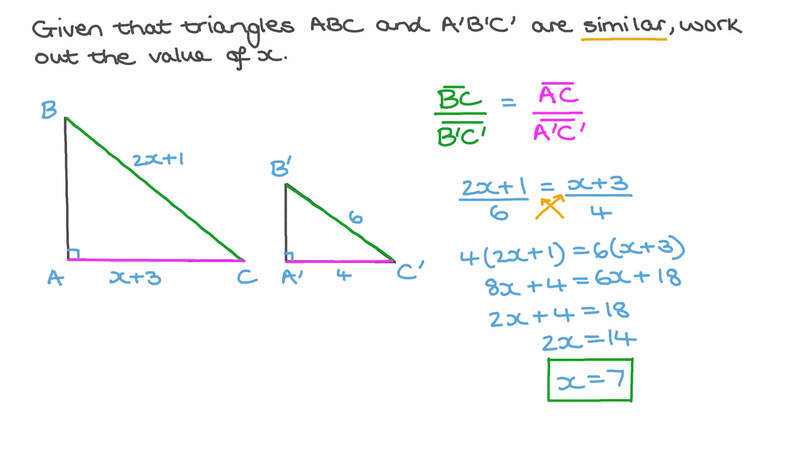 Given that triangles 𝐴 𝐵 𝐶 and 𝐴 ′ 𝐵 ′ 𝐶 ′ are similar, work out the value of 𝑥 . If 𝐵 𝐸 𝐹 𝐴 ∼ 𝐸 𝐷 𝐶 𝐵 , find the value of 𝑥 . Given that 𝑄 𝑅 𝑃 𝑀 ∼ 𝑆 𝑉 𝑍 𝑊 , find the value of 𝑥 . Given that the two polygons are similar, find the value of 𝑥 . These two shapes are similar, and their areas 𝐴 1 and 𝐴 2 are given. Find the value of 𝑥 . 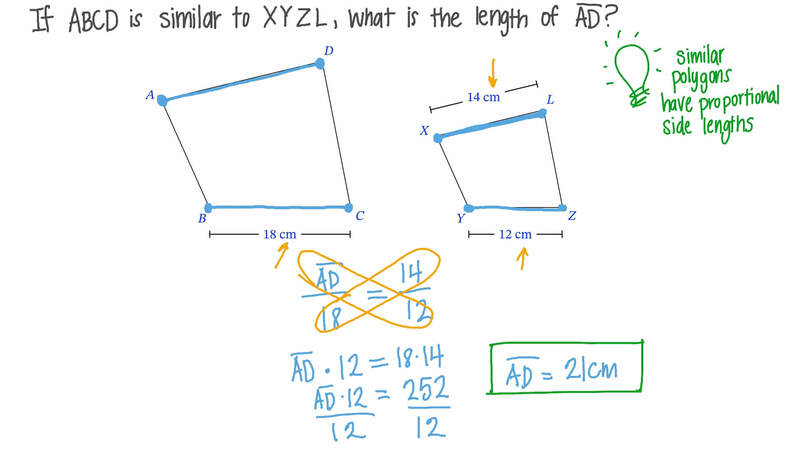 Given that the two given polygons are similar, determine the value of 𝑥 . Given that 𝐴 𝐵 𝐶 𝐷 ∼ 𝐸 𝐹 𝐺 𝐻 , find the values of 𝑥 and 𝑦 . Given that 𝐴 𝐵 𝐶 𝐷 ∼ 𝑋 𝑌 𝑍 𝐿 , determine 𝑚 ∠ 𝑋 𝑌 𝑍 . Given that 𝐴 𝐵 𝐶 𝐷 is similar to 𝑄 𝑆 𝑅 𝑃 , find the values of 𝑥 and 𝑦 .